First up, don't submit answers or comments telling me to "just fly". I don't care if that's easier or even cheaper. That would not be a question requiring travel experts. Secondly, I know full well that the Philippines has the worst possible record of ferry disasters. So don't submit answers or comments telling me it's too dangerous either please. So with that out of the way, if you are an expert on travelling overland / by ferry in Southeast Asia then please let me know which routes you know of to get from any country on the Malay Peninsula to anywhere in The Philippines, by surface travel only. Convoluted routes involving hopping a bunch of times from island to island and country to country are fine! So far I can only find routes going south through bits of Indonesia, but the pages I found were at least a couple of years old and other Google hits gave me the impression that some of the ferries are no longer operating. 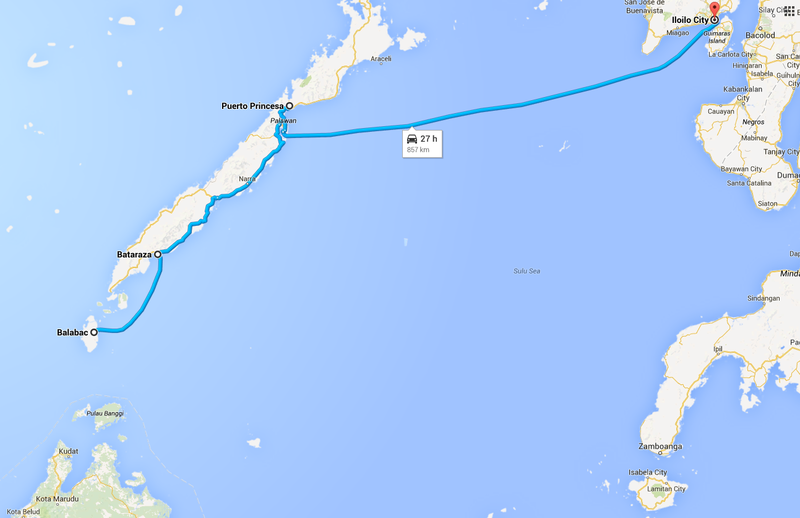 So does anybody know in 2014 how to reach the Philippines by boat from anywhere in Southeast Asia? The info in these pages is raw, unchecked, of various ages, and might not include an entire possible route in 2014. I don't have a complete answer, but I think you can actually get pretty far by ferry alone. There's a ferry between Puerto Princesa and Iloilo City. You can get there by taking the ferry from Balabac to Bataraza and driving the rest (although there should also be a ferry between Bataraza and Puerto Princesa). Although I don't know any ferries to Balabac, the locals there are famous for trading with Sabah (northern Malaysia). There's about 50km of water between Balabac and Sabah. An alternative route would be over Zamboanga, but getting there would probably be even more difficult. Most (not all) ferries in the Philippines are handled by 2Go Travel. OK, this is not first hand experience, but if it helps. Following a comment in Lonely Planet I found this link, I have quoted that Lonely Planet link as well because it has someone who has personally vouched for this and even provided an email offering help for travellers. The next page also contains an update about a year ago, but you may not need it if you choose to use the company link. This does contain a ferry that is operating on 05th December 2014 (and 9th and 12th - I guess its Tuesdays and Fridays only) from Sandakan, Malaysia to some destinations including Iloilo in the Philippines. Not the answer you're looking for? Browse other questions tagged routes ferries southeast-asia overland philippines or ask your own question. Are there cycling-friendly cities in Southeast Asia (except Singapore)? Are there budget repositioning cruises from anywhere in East or Southeast Asia to Australia later in 2017?